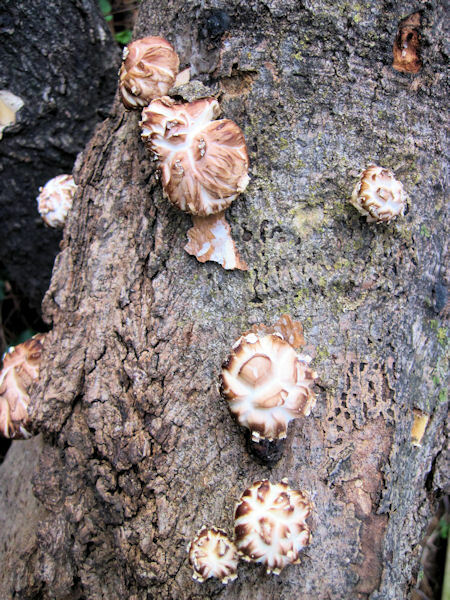 December 10, 2011 – December Mushrooms! Even though we’ve had some days in the single digits, the mushrooms are still producing! With this December harvest, that means for 2011, we have harvested something from the farm every month but January! We had an early sap run the last day of February and have harvested something every month since then. The bounty is amazing! 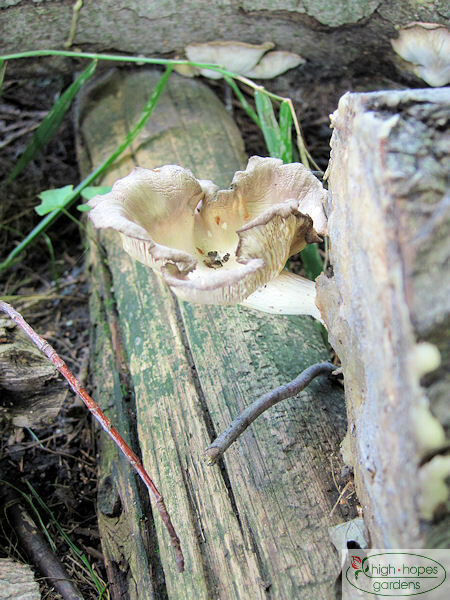 I was very surprised to find oyster mushrooms this week – I didn’t think to look, since we’ve finally had a dry stretch of weather. I was giving a farm tour as we may be the site of a possible farm event later this fall, otherwise I wouldn’t have seen them at all. Sometimes it takes a while for the old guys to catch on to new technology, even if they have it. 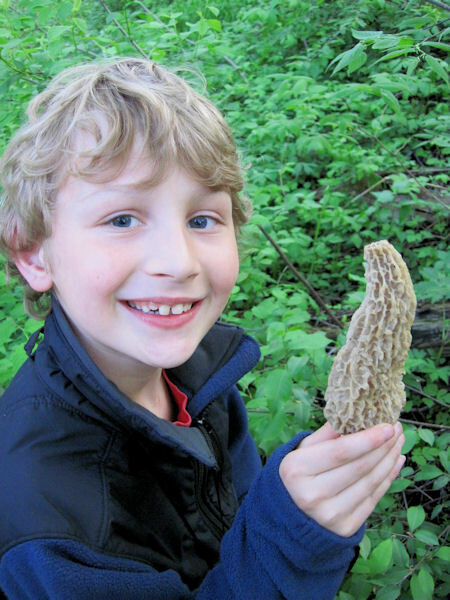 We were out morel mushroom hunting this evening after the rain passed and Martin asked if he could bring the GPS. Although we didn’t find enough to justify marking a spot, it could have been just the thing to grab the coordinates and see if they reappear in the same spot next year. Ah, now we are approaching the garden dining season. 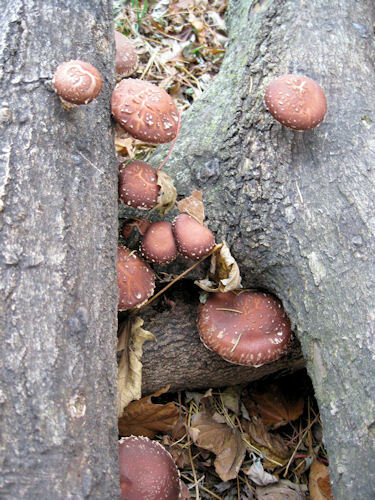 The shiitake mushrooms have appeared – it looks like the logs have some more life left in them this year! I didn’t do logs last year, so these must be two-year old logs. 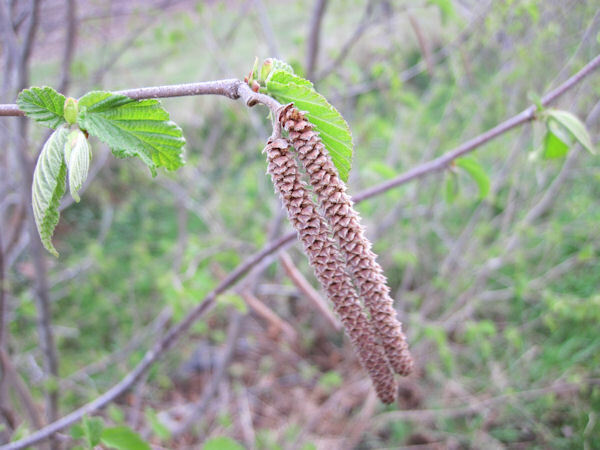 The hazelnut flowers look delicate in the wind – looks like the shrubs are really going to put out this year. Today was a great day to “plant” oyster mushrooms. First step is to have a tree in mind. Oysters do well in soft maples. It’s best to find a “tree that doesn’t have a future.” In this case, the scrawny silver maple between the walnut on the left and silver maple on the right meets that definition. The photo on the left is before the tree was cut down, and the one on the right, after the tree came down. 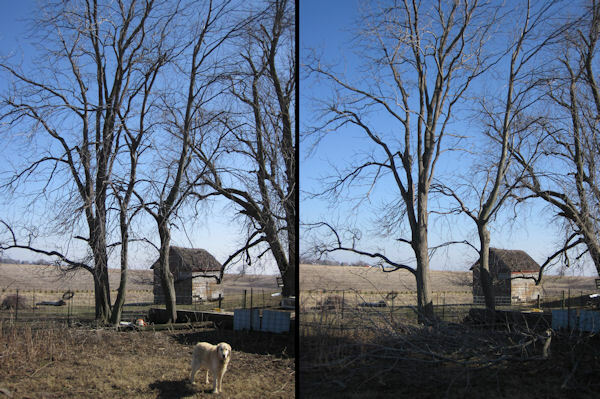 The tree was cut up into lengths and moved to the yard for processing. First step is to drill holes about two inches apart all around the log. 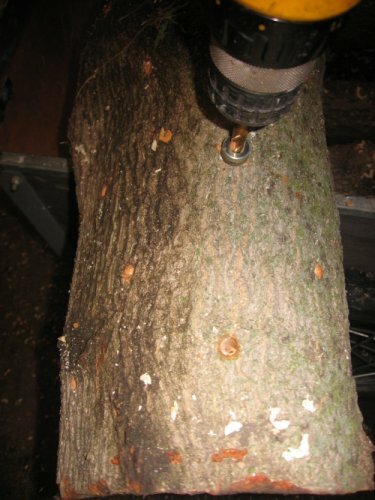 The bit has a special collar to drill exactly the right depth into the log. 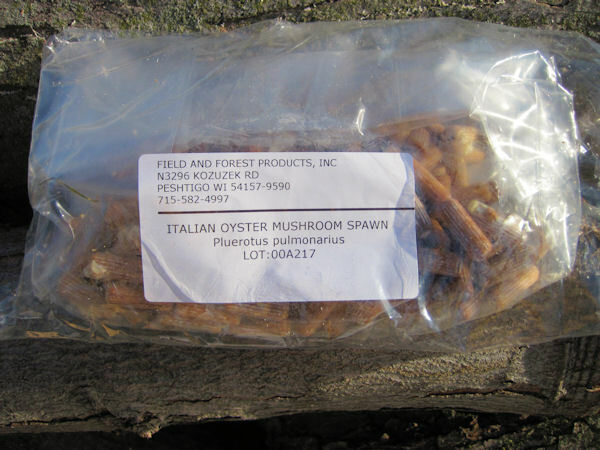 Here’s the “seeds,” in this case Italian Oyster spawn impregnated on wooden dowels. 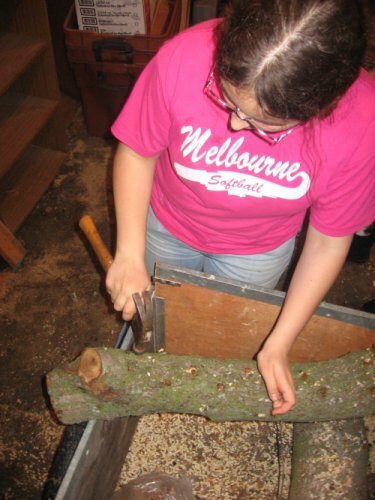 The dowels are pounded into the logs with a hammer. 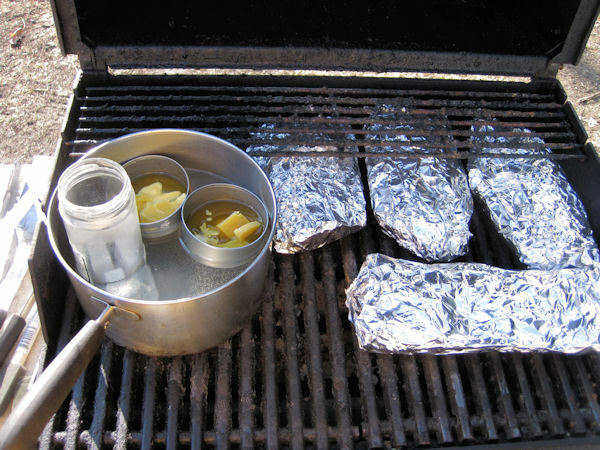 Since it was a beautiful day, and it’s hard not to multi-task, while the wax was melting, part of dinner was on the grill at the same time. We used to use regular paraffin wax in the past, but heard that beeswax works better, so here we’re melting a bit of both and will see which one works better. 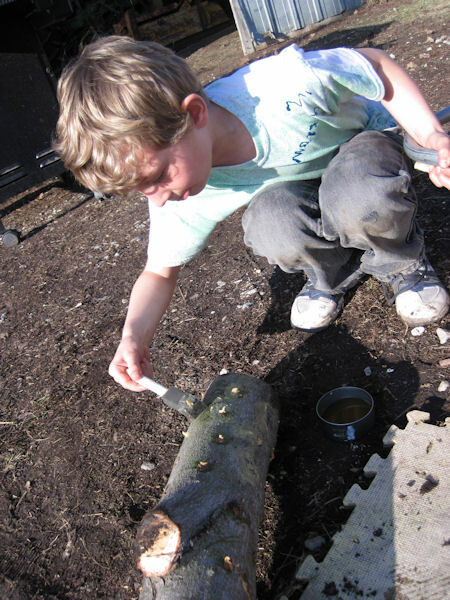 Martin is applying the wax to seal up the log – all the plugs and cut surfaces need to be sealed up to conserve moisture in the log. 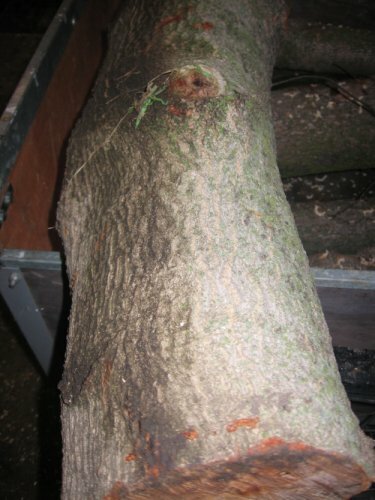 A completed log. I’ll move the logs to a cool, shady place and wait a few months for the mushrooms to pop! 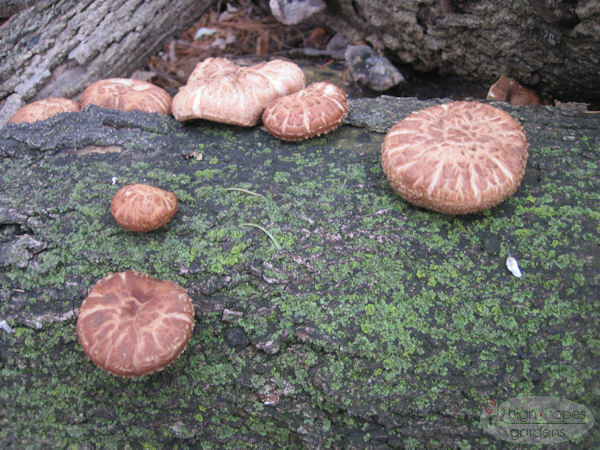 Because the weather has been so cool lately, I didn’t think of looking for a fresh flush of shiitakes on the logs we spawned. So tonight we had another high hopes exclusive meal. Shiitakes and onions from the farm sauteed in sesame oil. Walleye caught in the BWCA this summer, along with fresh brussells sprouts and applesauce from the farm – not bad for end of October. 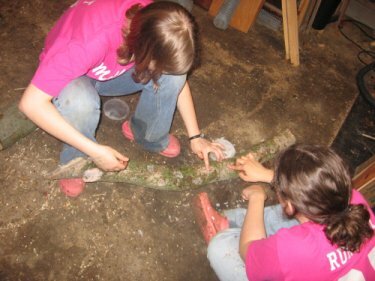 Today was the second time we “planted” shitaake mushrooms in logs. 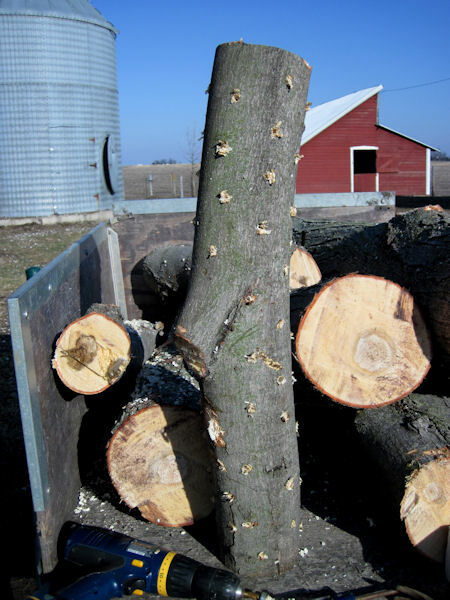 The logs we did last year have not yet fruited, but the time-frame is usually 12-18 months, so we are still waiting. This a log before the process starts. 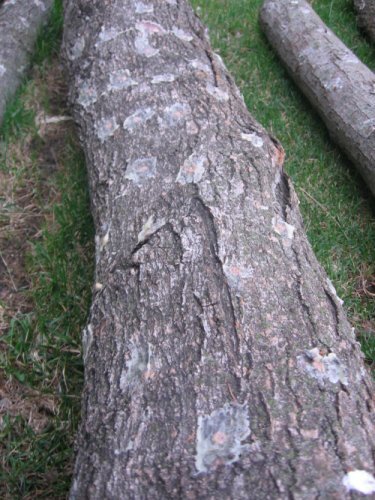 The ideal log is about 3-8 inches thick and about 40 inches long. Oak is the best, but most non-conifers work fine. 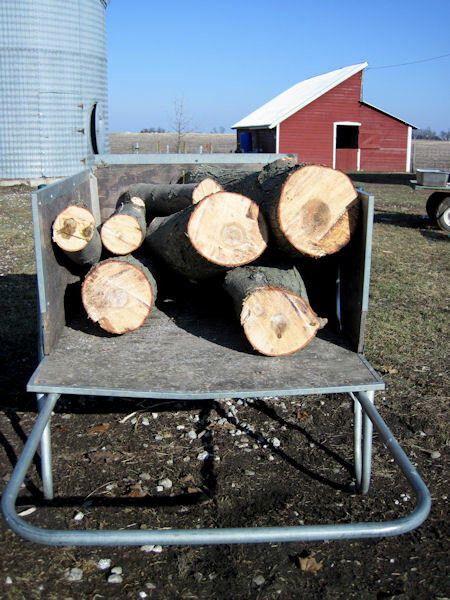 Harvest logs while dormant. We had a good supply that broke off in ice storm. The first step is to drill holes in lines about 6 inches apart and in rows 2 inches apart. 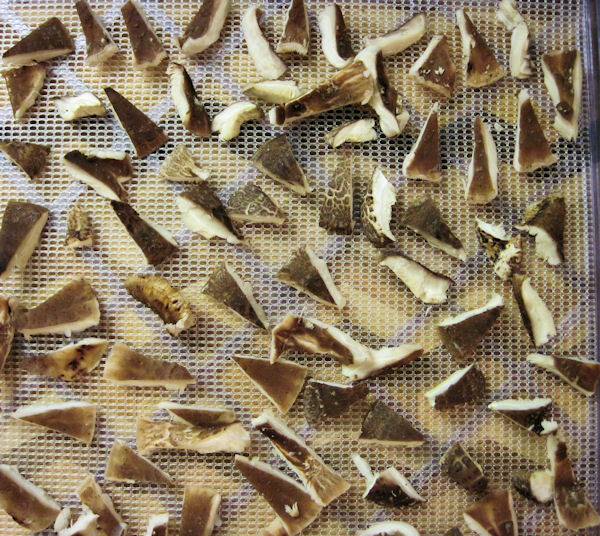 We ordered spawn on wooden dowels that are pounded into the drilled holes. 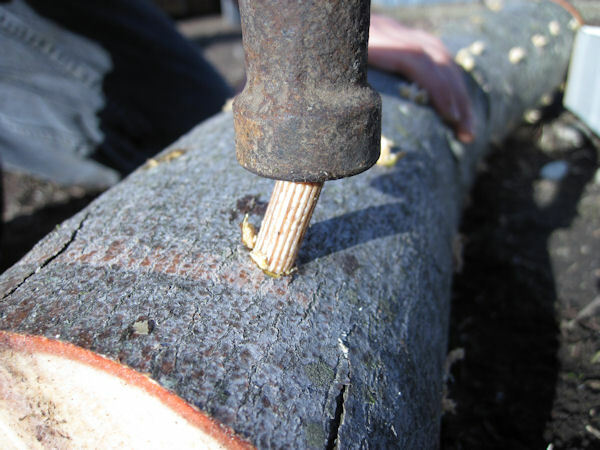 The final step is to seal each plug and the ends of the logs with wax, to preserve moisture. Here’s a completed log. 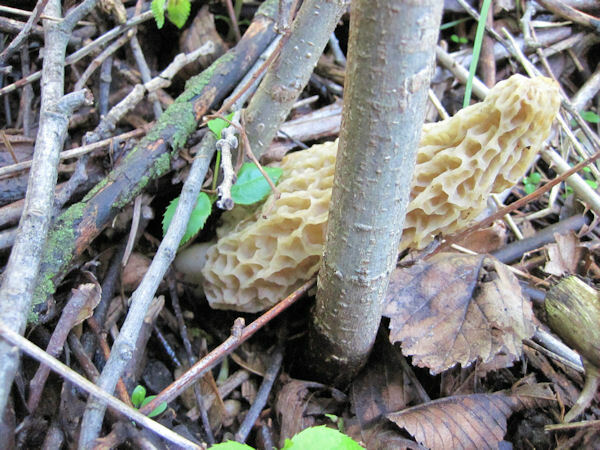 The last step for a while is to stack the logs in a shady, moist spot until they start fruiting in 12-18 months.